The stability ball doesn't only have to serve as an unconventional office chair. Get to work with this stability ball workout for your abs by @soulfulsarahh. You'll be doing 3 sets of 25 reps for each move. You'll build core strength and target your lower abs in particular. If you don't have a stability ball handy, use a set of paper plates or paper towels to increase your range of motion. Do the raised crunches on the surface of a couch as an alternative. Work up a sweat with this stability ball workout for your abs and tag your workout videos on Instagram with #TeamPumpUp so that we can see how hard you worked! Keep your back flat on the stability ball. Your hands will rest at your temples and your elbows will be bent outwards. Your legs should make a ninety degree angle with the stability ball. Lift your upper body off the ball with control, crunching up and tightening your core. Lower your body down and repeat. Lower your entire body onto the floor. Rest your feet on top of the stability ball and lay your arms down beside you. Use your feet to roll the ball towards your upper body, bending your knees as you do so. Slowly and with control, roll the ball back to starting position. Repeat. Begin in a raised plank position. Your arms are extended in a straight line off the floor, keeping your wrists in line with your shoulders. Your feet will be resting on the stability ball and your body should be parallel to the ground. Keep your neck in a neutral position and use your feet and lower abs to bring the ball toward your upper body. Do this slowly and with control. Return ball back to starting position, once again engaging your core and your lower body. Repeat. For this stability ball workout for your abs, do each move for 25 reps. Do 3 sets of the circuit for maximum results. Tag your workouts on PumpUp with #SweatySunday to show how you worked up a sweat! Loved the workout? Comment below if you tried it! 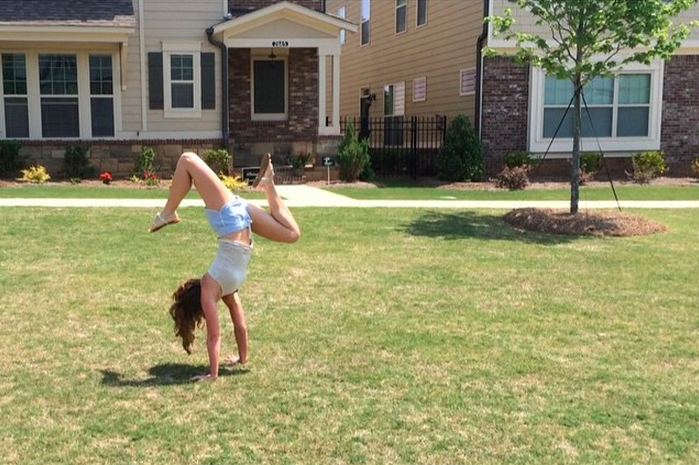 Follow @charlottefitgirls on Instagram for more videos, workout inspiration, and more! Do you have no-joke workout videos to share with the PumpUp community? Tag your videos on Instagram with #TeamPumpUp so that we can see them! Pin this workout or print it out so that you can have it with you the next time you're at the gym! Do these carefully and make sure you land quite softly on your feet when you perform the jump knee tuck in order to prevent injury. As p90x's Tony Horton would say, think like a cat. Love it or loathe it, the burpee is a go-to, zero-equipment full-body workout. A 155-lb person can burn up to 10 calories per minute by doing burpees. Add in the jump knee tuck, and you'll be expending tons of energy in no time. This is a tricky exercise to do with proper form. When done properly, the plank to pushup is an integral component of this intense partner workout. It'll help to strengthen your core by challenging you to stabilize your muscles while you're moving. Start in a regular plank position, shoulder directly in line with your wrists. Lower your arms one at a time into an elbow plank, then push back up again on each side. Phew! No crunches! Mountain climbers give you a bit of extra cardio, helping you burn fat while strengthening your obliques. Strive to drive each knee towards the opposite shoulder. Focusing on achieving this full range of motion will challenge your core even more. Not familiar with yoga? Who cares! Don't be intimidated by this exercise. Also known as the four-limbed staff pose, the chatarunga is a staple move that seriously challenges your upper body and your core. When you're getting into the chatarunga, keep these tips from PopSugar Fitness in mind. Make sure you don't roll your shoulders, keep your arms at a ninety-degree angle when you're in plank position, drive your heels forward (rather than having your toes pointed), have your hands flat on the mat, and look just slightly ahead of you; don't crane your neck up. Share this workout with a friend so that you can perform this intense partner workout together! Check out more of our workouts here and comment below to let us know what you think! This exercise circuit was published courtesy of PumpUp members @aichatytgat and @tinytinne, from their fitness Instagram account, @thedoublethreat. Jump off the stepper and do lateral jumps to the other side. Mount the stepper with one leg, keeping the opposite foot slightly on the ground. Crunch your knee towards the opposite side, then tap your foot behind you on the opposite side. Jump off the stepper and repeat step one. To participate in the challenge, tag @katefit_ and #katefitmas on Instagram. PumpUp’s @jenac showed us these killer raised #pushups on #SweatySunday. How did you spend yours? "Working out is about being comfortable with being uncomfortable," said Jen. "One of my greatest achievements has been learning to accept the soreness and the sweat. I do complain about how exhausted I am but honestly I wouldn’t trade that feeling for anything because at the end of my workout, I know that I’ve surpassed last week’s intensity." According to Jen, when we exercise, we intend to exceed the limitations that we’ve placed on our minds and bodies while unintentionally silencing the doubters around us. Keep pushing and make sure you tag today’s workout photos with #SweatySunday and with #TeamPumpUp if you’re sharing anywhere other than PumpUp! For more workout gifs and fitness tips, follow PumpUp on Tumblr. Have you been able to accomplish a move that you’re proud of on Workout Wednesday? Watch these front and back flips from new PumpUp member guusjevangeel!